The 1,000-year-old Way of St. James (El Camino de Santiago - in Spanish), is an old pilgrim route which criss-crosses Western Europe, arriving at Santiago de Compostela in Northern Spain on the Atlantic coast. Some 200,000 people travel the Camino each year from all over the world: Some people walk, others travel by bike. Many travellers choose to do the Camino for personal, rather than any spiritual or religious reasons - taking time out from their busy/modern lives and perhaps finding inspiration along the way, whilst reflecting on their life in a supportive environment. 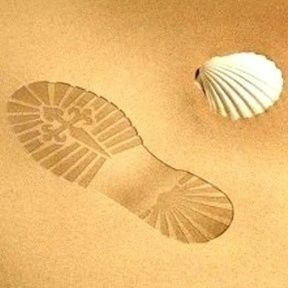 Many carry with them a Scallop Shell like this. Everyone experiences the journey in a different way. Wish your friends or loved-ones well by sending this meaningful present. It is a lovely little gift to show someone that you really care about them and their safety and well-being. Description: The metal scallop shell charm measures 20mm in length including the hanging ring, by 15mm in width and is accompanied by pretty scallop shell beads. It hangs on a fine black 17" double cord. We can add a 2" extender chain: Please choose in Options Box. 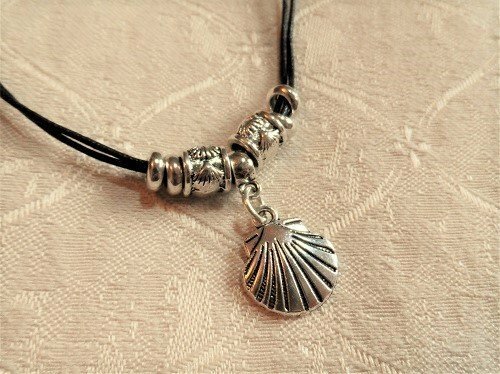 Gift a Camino scallop shell to inspire your friends and perhaps help them to be fortunate and safe in their life especially when travelling. Comes gift-wrapped, like all our presents - and we can print a personal message on your behalf.